Our work is post-historical, it is set in a distant future after the age of man. It’s about nature, which still has to deal with the consequences of the human era. It’s not natural nature, but a twisted one. Firstindigo&Lifestyle: How did IC-98 get started, what was your thesis during the first few years? IC-98 (artist duo Patrik Söderlund and Visa Suonpää): We met at the University of Turku, majoring in Cultural History and Art History. We wanted to broaden the scope of academic writing by bringing our “writing” into public space. This idea became our program: to make site-specific interventions in public space, be they installations or anonymously distributed booklets. How do your art works communicate with theoretical thinking, do you consider to be conceptual artists? IC-98: The works start with conceptual and/or contextual analysis. This depends on the project at hand. Site-specific works start from research; animations are amalgamations of conceptual thinking, adjusted storytelling and handcraft. But if we should characterize ourselves shortly, we’d say we are conceptualists first. Can you name some of the most important theoretical premises that could be your guidelines? How about your artistic influences? IC-98: Our theory comes mostly from the left-leaning French poststructuralism: Michel Foucault, Gilles Deleuze & Felix Guattari, Michel Serres, with an important German addition: the work of Walter Benjamin. Artistically we do not have many modern or contemporary influences. Visually we lean towards 19th Century and the history of depicting landscape: Claude Lorrain, Gianbattista Piranesi, Caspar David Friedrich, and William Turner. The important thing about 19th Century is the fact that it is often at the same time the prehistory and a mirror image of our own time: in many respects, the world was the same but the underlying processes are still more visible (think Jacquard loom vs. laptop: they share the same binary logic but where laptop is a black box, in the loom we still see how the thing actually works). Could you tell more about the process itself, in what ways do your concepts or visual process evolve, are there any common or repeating parameters in the making? For example, how do you choose your visual atmospheres, like create the sets, lighting, how does the process unravel itself? IC-98: The style is based on the fact that the animations visually start with pencil drawing. From this stems the fact that the animations are black and white. So it is a material, not a stylistic element. The different atmospheres and recurring elements, our visual vocabulary (fog, mist, stars, water) is functions of the scripts, which often deal with multi-rhythmic time and transformations of energy and matter. The script always comes first; even lighting should carry parts of the story. If we cannot justify a visual element, we omit it from the final work. Technically the “scene” is fashioned after 18th century theatre: the image is composed of flat layers and digital effects between these layers. We try to keep it simple, not to be too much carried away by the limitless possibilities of cgi (Computer-generated imagery). When we compose a scene, the pencil drawings are first scanned, then composed into layered scenes and lastly animated. What do you want to say about your idea of ‘Events’, and about the ‘possibilities’ that can be found in your artworks? IC-98: The idea of a moment being pregnant with possibilities – or situationistically speaking “constructed situations” – comes from our earlier practice. We combined situationist thinking with Deleuze’s idea of the actual and the virtual and Benjamin’s Theses on History to conceive an idea of an intervention/work as an event making the user/viewer aware of the interconnectedness of past and future possibilities. As Deleuze beautifully writes, the present moment is surrounded by a cloud of virtualities, the unactualized past events, which maybe did not take place but can still happen. This we still consider the political element of our work even when the animations might at first sights appear visually anachronistic. Is it relevant to always question time and space as elements in you work-in-process? IC-98: Coming from the background of both visual arts and history, the complex nature of time is elemental in our work. Animation enables us to show multiple temporal rhythms in one image frame. Sometimes it is about the passage of time as such, then again it might be about a certain time in history. What are the three things you would tell about yourself to North American audience today as an introduction? IC-98: We have worked over multiple media for almost 20 years now. During this time, we have developed a visual language – be it artist publications, installations or animated films –, which combines the theoretical and the political with the visual and emotional. And important element here is the combination of old school (drawing) craft and the new digital media. You have participated in Art Fairs in New York City, in fact at the VOLTA Art Fair couple of years ago, how was the reception from the audience and organization, how about other experiences from local scene? IC-98: The reception has been good, though ours are relatively difficult works in the fast paced fair circuit. You need to be able to give time to the work. Then again, even a quick glance of the “surface” communicates the classical quality of crafting the artwork – though it’s in digital form. Some time has passed since the opening of the 56th Venice Biennale, what are your most important remarks from the art biennale so far, did the location and site change the actual process? How do you feel, are you able to follow up what takes place during the art exhibition? IC-98: Working on site-specific projects has taught us that it’s always about communication between the site and us, the hermeneutics of place. In Venice we realized, that we had mostly done the research over the years already (the questions of territory, public space, wood and woods, the history of the Finnish welfare state, the relations of humanity, architecture and nature as a whole). The challenge then was to find the best way to tell the story in a framework of very strict regulations. We were first working on a more ephemeral and performative format, but had to recur to our most well known medium in the end: the animated film. During the biennale we have mostly received comments from visitors now and then. But, the perception of our own work hasn’t changed during the process. We have always done a lot of thinking and tried to take into account all the possible permutations of a given site or situation. It seems that ‘Hours, Years, Aeons’ has duration and layers, what does the work narrate about? It starts forming in the cave, and goes through time in history? Does it deal with today’s hot topics, such as climate change? IC-98: It’s very much about climate change, the much talked about questions of the Anthropocene (note: Wickipedia defines this as: proposed epoch that begins when human activities started to have a significant global impact on Earth’s ecosystems). But our work is post-historical, it is set in a distant future after the age of man. It’s about nature, which still has to deal with the consequences of the human era. It’s not natural nature, but a twisted one. The work exists both as a spatial multi-screen installation and the linear film shown in Venice. The Venice version let’s us experience long, geological stretches of time – the aeons. Specifically, the work has a background in the nuclear waste repositories, how something is buried deep into the ground. But as we all know, what is buried, will once surface again. 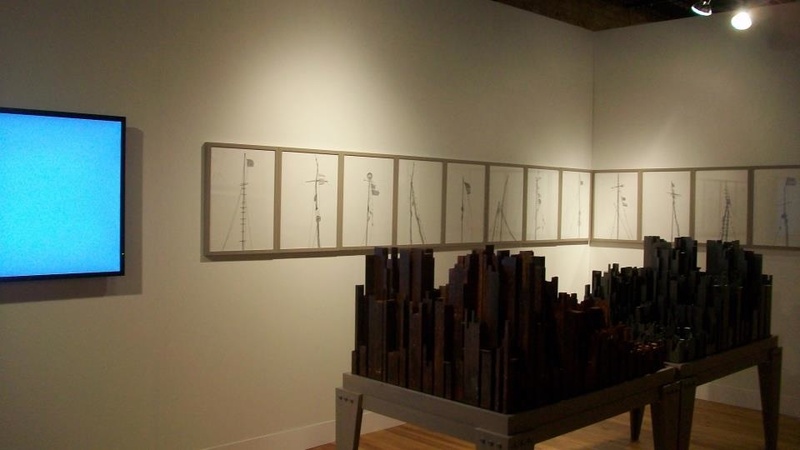 IC-98 installation view at the 56th Venice Biennale. IC-98 installation view at the Venice Biennale 2015. IC-98 installation view of ‘Hours, Years, Aeons’, 2015. Entrance to the IC-98 installation at the Venice Biennale. photos: courtesy of IC-98. Outside the Pavilion of Finland at the 56th Venice Biennale. Did you find time-based media works as your medium from the very beginning of your artistic career? How about your sculptural works, and the ways different media communicate with each other? IC-98: We considered our free distribution books already time-based in a sense. The installations often include an interactive element, which means that they work in space but also as a part of lived time. We have liked the idea of the viewer as a user. But formally we entered the temporal realm when we wanted to make animations. The main idea was to be able to show the chains of cause and effect and use certain cinematic techniques to speak not only to the intellect but also the senses. Time-based media has a different nature than other art works. What is your opinion about it, how do you see your art from the point of view of the future, what could be the time-span? Finally, what are your ongoing and new propositions for the future? IC-98: We are in the preproduction phase of our first feature film, ‘The Kingdom of Birds‘. It’s loosely based on the life’s work of Finnish deep ecologist, eco-fundamentalist, ornithologist and fisherman Pentti Linkola. The film imagines an old fisherman’s last day on earth in a future where all of mankind has perished. It is time for other species. The 56th La Biennale di Venezia is open until November 2015, where IC-98 is represented.